Sysdig is open source, system-level exploration: capture system state and activity from a running Linux instance, then save, filter and analyze. Sysdig is scriptable in Lua and includes a command line interface and a powerful interactive UI, csysdig, that runs in your terminal. 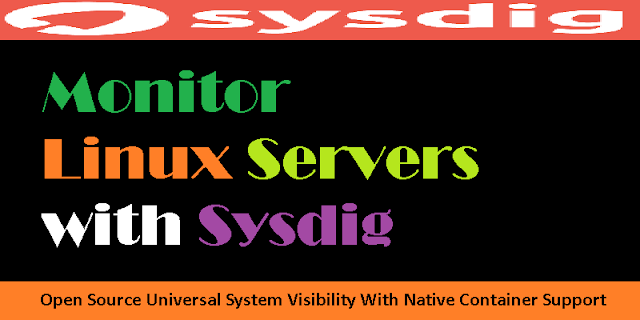 This article will guide you through the steps to install and configure Sysdig to monitor an Ubuntu 16.04 server as an example using Sysdig. There's a Sysdig package in the Ubuntu repository, but it's usually a revision or two behind the current version. At the time of publication, for example, installing Sysdig using Ubuntu's package manager will get you Sysdig 0.8.0. However, you can install it using an official script from the project's development page, which is the recommended method of installation. This is the method we'll use. Running module version sanity check. Now that you've got Sysdig installed, let's look at some ways to use it. But, as you'll see as soon as you run the command, it can be difficult to analyze the data being written to the screen because it streams continuously, and there are lots of events happening on your server. Stop sysdig by pressing CTRL+C. 253573 11:16:42.808346955 0 sshd (12392) < read res=2 data=..
evt.num is the incremental event number. evt.outputtime is the event timestamp, which you can customize. evt.cpu is the CPU number where the event was captured. In the above output, the evt.cpu is 0, which is the server's first CPU. proc.name is the name of the process that generated the event. thread.tid is the TID that generated the event, which corresponds to the PID for single thread processes. evt.dir is the event direction. You'll see > for enter events and < for exit events. evt.type is the name of the event, e.g. 'open', 'read', 'write', etc. evt.info is the list of event arguments. In case of system calls, these tend to correspond to the system call arguments, but that’s not always the case: some system call arguments are excluded for simplicity or performance reasons. fd: Filter on file descriptor (FD) information, like FD numbers and FD names. process: Filter on process information, like id and name of the process that generated an event. evt: Filter on event information, like event number and time. user: Filter on user information, like user id, username, user's home directory or login shell. group: Filter on group information, like group id and name. syslog: Filter on syslog information, like facility and severity. fdlist: Filter on file descriptor for poll events. Kill the command by pressing CTRL+C. Since this command filers on nano, you will have to use the nano text editor to open a file to see any output. Open another terminal editor, connect to your server, and use nano to open a text file. Write a few characters and save the file. Then return to your original terminal. Again, kill the command by typing CTRL+C. Getting a real time view of system events using sysdig is not always the best method of using it. Luckily, there's another way - capturing events to a file for analysis at a later time. Let's look at how. Though you can use Sysdig to capture a specified number of events to a file, a better approach would be to use the -C option to break up a capture into smaller files of a specific size. And to not overwhelm the local storage, you can instruct Sysdig to keep only a few of the saved files. In other words, Sysdig supports capturing events to logs with file rotation, in one command. Then, in another terminal connected to your server, open a file with nano and generate some events by typing text or saving the file. The events will be captured to sysdig-trace-nano.scap until sysdig records 200 events. Press CTRL+C after a few moments to exit. You can do a whole lot more when saving system activity to a file using sysdig, but these examples should have given you a pretty good idea of how to go about it. Let's look at how to analyze these files. That will dump the entire content of the file to the screen, which is not really the best approach, especially if the file is large. Luckily, you can apply the same filters when reading the file that you applied to it while it was being written. 21340 13:32:14.577121096 0 nano (27590) < write res=1 data=. 42651 19:58:04.279128102 0 sshd (22863) < write res=28 data=.8c..jp...P........s.E<...s.
42781 19:58:06.046969936 0 sshd (12392) < write res=28 data=M~......V.....Z...\..o...N..
43429 19:58:16.160788675 0 sshd (12392) < write res=28 data=..Hf.%.Y.,.s...q...=..(.1De. 43623 19:58:19.451689929 0 sshd (22863) < write res=28 data=.ZT^U.pN....Q.z.!.i-Kp.o.y.. Notice that all the lines in the preceding output contain 11.11.11.11:51282->22.22.22.22:ssh. Those are events coming from the external IP address of the client, 11.11.11.11 to the IP address of the server, 22.22.22.22 . These events occurred over an SSH connection to the server, so those events are expected. But are there other SSH write events that are not from this known client IP address? It's easy to find out. 294484 21:47:47.812318401 0 sshd (28766) < read res=1 data=. 294486 21:47:47.812320884 0 sshd (28766) < read res=1 data=. Further investigation also showed that the rogue IP address 33.33.33.33 belonged to a machine in China. That's something to worry about! That's just one example of how you can use Sysdig to keep a watchful eye on traffic hitting your server. Let's look at using some additional scripts to analyze the event stream. netstat: List (and optionally filter) network connections. spy_users: Display interactive user activity. listloginshells: List the login shell IDs. spy_ip: Show the data exchanged with the given IP address. spy_port: Show the data exchanged using the given IP port number. spy_file: Echo any read or write made by any process to all files. Optionally, you can provide the name of a file to only intercept reads or writes to that file. If you see ESTABLISHED SSH connections from an IP address other than yours in the Client Address column, that should be a red flag, and you should probe deeper. A far more interesting chisel is spy_users, which lets you view interactive user activity on the system. Then, open a second terminal and connect to your server. Execute some commands in that second terminal, then return to your terminal running sysdig. The commands you typed in the first terminal will be echoed on the terminal that you executed the sysdig -c spy_users command on. Next, let's explore Csysdig, a graphical tool. Csysdig is the other utility that comes with Sysdig. It has an interactive user interface that offers the same features available on the command line with sysdig. It's like top, htop and strace, but more feature-rich. That will open an interface like the one in the following figure, which shows event data generated by all users and applications on the monitored host. At the bottom of the interface are several buttons you can use to access the different aspects of the program. Most notable is the Views button, which is akin to categories of metrics collected by csysdig. There are 29 views available out of the box, including Processes, System Calls, Threads, Containers, Processes CPU, Page Faults, Files, and Directories. When you start csysdig without arguments, you'll see live events from the Processes view. By clicking on the Views button, or pressing the F2 key, you'll see the list of available views, including a description of the columns. You may also view a description of the columns by pressing the F7 key or by clicking the Legend button. And a summary man page of the application itself (csysdig) is accessible by pressing the F1 key or clicking on the Help button. The following image shows a listing of the application's Views interface. This can make csysdig start up faster, but the speed gain is negligible in most situations. You'll notice that that was the same option you used to view the filters available with sysdig command. So sysdig and csysdig are just about the same. The main difference is that csysdig comes with a mouse-friendly interactive UI. To exit csysdig at any time, press the Q key on your keyboard. 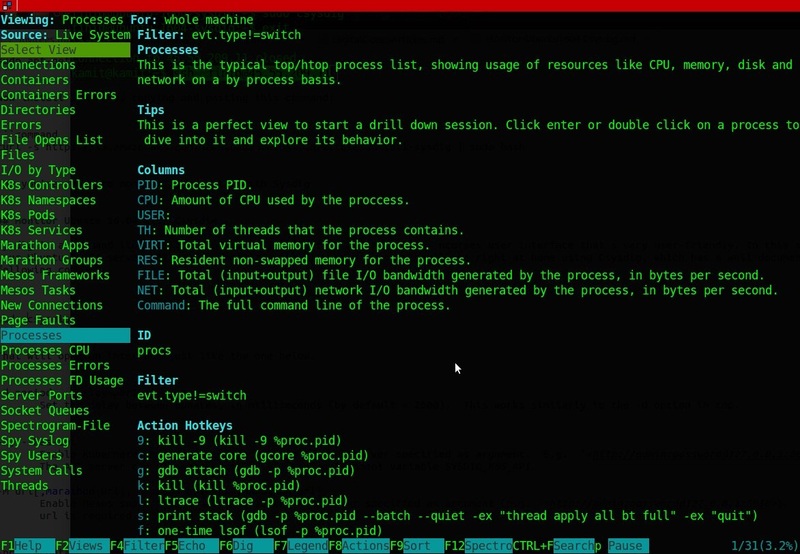 Sysdig helps you monitor and troubleshoot your server. It will give you a deep insight into all the system activity on a monitored host, including those generated by application containers. More information is available on the project's home page. Cool stuff, lightweight monitoring tool for Linux. there you have it now.